While I was thinking about the “State of the Union,” I fell upon this article – “Decision-Making and Coping by Functionally Illiterate Consumers and Some Implications for Marketing Management” by Madhubalan Viswanathan, Jose Antonio Rosa and James Edwin Harris in the Journal of Marketing . Clear, obvious presentation. Clear presentation of bottom-line prices for all items in a consistent color would enhance the information environment for low-literate consumers. The final price should be plainly presented, in addition to the original price and the discount. Moreover, the use of dollars and cents off rather than fraction or percentage off can make the final price concrete and obvious. Retail outlets should also consider simple computational aids for their customers, such as devices attached to shopping carts that scan product labels and keep running totals. Consumer-friendly store layouts. Easy store layouts that minimize clutter and confusion are important for all consumers. But the layout takes on even greater significance for functionally illiterate consumers. Of particular significance are changes to layout that take away from the experience of shopping in a familiar environment. Prominent store signs should be supplemented with visual representations of product categories. Similarly, shelf and other in-store displays can communicate product information and make comparisons easier. Graphical representations of size, ingredients, and other information needed for comparisons would also be very helpful. Helpful staffing. In light of the life experiences of low-literate consumers and issues of self-esteem and dependence, friendliness and trustworthiness are vital in building customer relationships. Their customer loyalty seems to follow from friendly encounters that engender trust. Like many of us, they want to feel understood and appreciated. Specialized training for employees should sensitize them to the unique characteristics of low-literate customers. Such an investment may well lead to a sustainable competitive advantage stemming from strong customer loyalty. The solutions marketers devise for illiterate consumers may well coincide with solutions for a variety of other groups such as novice consumers, time-constrained consumers, consumers in developing countries, and consumers shopping in different environments, such as a foreign country. Welcome to the Third World, US of A. Don’t worry about the poor, let’s just make sure we can sell ’em something! Britton Manasco and I have just launched a new blog on business intelligence, analytics & performance. We’ve both been toying w/ the idea for some time (over a year, in my case) and the time seems right to go for it. We’ve named the blog “Intelligent Economy” because that’s what this movement is about. When I took a sabbatical many years ago to teach Math to highschool kids, I used to think “Mathematics is God’s language.” Now, increasingly, it is also the language of business. I think it’s going to be a fun journey. And if you’ve got some brilliant analytical research you need to share with the rest of the, drop us a line. Here we go again. Wired has a story on The Importance of Being Pretty. They’re talking about your website. The study in question comes to us from Dr. Gitte Lindgaard, a psychology professor at Carleton University in Ottawa. She’s the “NSERC/Cognos Industrial Research Chair in User-Centred Design” at Carleton. No one mentions the report title, but I believe it’s this one: “Attention web designers: you have 50 milliseconds to make a good first impression”, Behaviour & Information Technology, 25, 115-126, Lindgaard, G., Dudek, C., Fernandes, G. & Brown, J., 2005. In the study, researchers discovered that people could rate the visual appeal of sites after seeing them for just one-twentieth of a second. These judgments were not random, the researchers found — sites that were flashed up twice were given similar ratings both times. “Unless the first impression is favorable, visitors will be out of your site before they even know that you might be offering more than your competitors,” said Lindegaard. This study is just another example of lab-myopia. It’s dangerous. And detrimental to real-world business performance. Lindgaard doesn’t get it. – Gerry McGovern: “It is unquestionably true that people are highly impatient on the Web. However, it is hard to understand how people can get an impression of a website in one twentieth of a second, when most webpages takes several seconds to download. (Laboratory conditions are not the same as real-life conditions.) Function and visual appeal do not have to be in conflict. However, it is clear that the websites that are making the most money are focusing much more on function than visual appeal. What would be the value of asking people to rate the visual appeal of Ryanair.com, Aerlingus.com, eBay.com, or Yahoo? We need to be careful about the questions we ask because they could lead us down the wrong path. – Jakob Nielsen: It’s a dangerous mistake to believe that statistical research is somehow more scientific or credible than insight-based observational research. In fact, most statistical research is less credible than qualitative studies. Design research is not like medical science: ethnography is its closest analogy in traditional fields of science. User interfaces and usability are highly contextual, and their effectiveness depends on a broad understanding of human behavior. Typically, designers must combine and trade-off design guidelines, which requires some understanding of the rationale and principles behind the recommendations. Issues that are so specific that a formula can pinpoint them are usually irrelevant for practical design projects. Online, form without function is a disaster. And that’s why I get mad at “lab-researchers” like Lindgaard. The internet helps maintain people’s social networks, and connects them to members of their social network when they need help. 60 million Americans have turned to the internet for help with major life decisions. These are the findings of a new report from the Pew Internet & American Life Project. 1. The internet helps build social capital. 3. Email allows people to get help from their social networks and the web lets them gather information and find support and information as they face important decisions. 4. The internet supports social networks. 5. Email is more capable than in-person or phone communication of facilitating regular contact with large networks. 6. Email is a tool of “glocalization.” It connects distant friends and relatives, yet it also connects those who live nearby. 7. Email does not seduce people away from in-person and phone contact. 8. People use the internet to put their social networks into motion when they need help with important issues in their lives. 9. The internet’s role is important in explaining the greater likelihood of online users getting help as compared to non-users. 10. Americans’ use of a range of information technologies smooths their paths to getting help. Those with many significant ties and access to people with a variety of different occupations are more likely to get help from their networks. 11. Internet users have somewhat larger social networks than non-users. The median size of an American’s network of core and significant ties is 35. For internet users, the median network size is 37; for non-users it is 30. 12. About 60 million Americans say the internet has played an important or crucial role in helping them deal with at least one major life decision in the past two years. 13. The number of Americans relying on the internet for major life decisions has increased by one-third since 2002. 14. At major moments, some people say the internet helps them connect with other people and experts who help them make choices. Others say that the web helps them get information and compare options as they face decisions. Source: Jeffrey Boase, John B. Horrigan, Barry Wellman, Barry, and Lee Rainie. The Strength of Internet Ties. Washington, DC: Pew Internet & American Life Project, January 2006. Wise companies will look at this report carefully, and figure out ways to use this social power of internetworking. In his latest column in Newsweek, Bill Gates talks about knowledge as an adjective- as in knowledge economy, knowledge worker, knowledge networks etc. He mentions Tom Davenport’s definition of knowledge: “Knowledge is information combined with experience, context, interpretation, and reflection.” . I have an idea for Gates in this regard, but I don’t know how to get it to him (maybe I’ll ask my buddy Tom Davenport). But the knowledge in a knowledge network resides in the heads of people. Why not connect people to other people? Or better yet, to virtual communities on that topic? I’ve said too much already. A management consultant, lecturer, and business writer, Haughton’s latest book, It’s Not What You Say… It’s What You Do – How Following Through at Every Level Can Make or Break Your Company was published by Doubleday in 2005. In 2001 Haughton co-authored It’s Not the Big that Eat the Small… It’s the FAST that Eat the Slow– a Wall Street Journal, USA Today, and New York Times bestseller that was translated for sale in 26 countries around the world. Here’s the interview I’ve been promising to post on the site. The biggest preconceived notion I had was that there wasn’t enough accountability in the world, and that why things didn’t get done. I used to think that people didn’t take completing their work seriously or their bosses didn’t make the consequences serious enough. I have a very high degree of what psychologists would call conscientiousness, which can make me a real pain to be around. So that’s why I thought I got things done, and others didn’t. Also a nag. I used to look to blame people. I’ve visited companies that work that way, and I’m now convinced that’s dead wrong. So the concept that all the world needs is accountability and more dire consequences, or the opposite view- a motivationalist view that all you need is more attaboys! Whichever side you want to be on, they’re both wrong. The key is that you have to find the line between enough and too much accountability. The line is not that hard to find. I lay out a prescription in the book. But it depends on the type of project you’re working on. For example, is it more important that everyone communicates, coordinates and cooperates or is it more important that you know to last scintilla who it is that specifically dropped the ball that caused an interruption. Pinpoint accountability is totally unproductive in certain industries- the airline industry, for example. Research shows us that managers who take accountability too far, especially in businesses where follow through requires rapid responses to unpredictable changes, chip away at each individual’s willingness to look past personal interests and work with others to make sure what’s expected gets done. In the book you’re saying that execution is critical. And yet you take Larry Bossidy to task. I can tell you that woke me up. Then I started exploring the difficulty that people have when directions aren’t clear. My book describes 4 building blocks that were developed after research showed us that 66% of managers use tactics that are prone to fail. 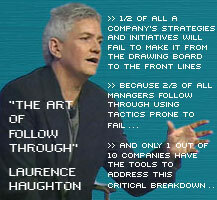 And the tactics fall under the 4 building blocks I describe in my book. I use the 4 building blocks to make it plain, to explain step-by-step what to watch out for. It’s so important that you have measurable objectives but even more important, you’ve got to have clarity. It was Einstein who said that if a scientific theory can’t be explained to a child it’s probably worthless. Think of the stuff that you read – the obtuse language, the jargon – in the marketing world and HR world for example. The team leader’s job is to make people understand, not confuse them. Not everyone has to be as smart as the leader as Linda pointed out, but everyone has to understand where we’re going as a team. Simple enough. But it’s far more complicated than you’d expect. It’s our job to make sure that what we say makes sense and is understood at every level of the company- by both platinum level players and nickel level players, and everyone in between. We all need to recognize that we have empathy inside us, and that we can up our ability to empathize. In the book I talk about reading between the lines. Take the world of the high-end restaurant business. A very competitive business, low barriers to entry… so how do you compete? How do you compete with people who are paid $12-15 dollars an hour? The key is to “put yourself in someone’s shoes.” That’s what Coraine has created, a recipe for that includes smarts, heart, and courage. There’s another story he tells us in the book as well, but you’ll have to read it. You mean the one about “chicken soup and crackers” after midnight? You mention how critical it is to make accurate assessments. How does that work? How many times do executives try a change program and when it doesn’t work, they simply come up with another change initiative. This is a huge problem. But some companies have the courage to stay the course. Take the case of SSM Health Care, another company I outline in the book. After 5 years of spending money and seminars and intense work on total quality management, a senior executive gets asked “Are we still doing CQI?” CQI was the continuous-quality-improvement initiative they had introduced five years earlier. To their credit, they realized they had been “mucking around.” So they dug in. Something was missing. And it came out that the problem was that they were not making accurate assessments. They were trying to solve problems before they did a decent stab at the root-cause. Ask “why” 5 times. The tendency is to try to fix something as soon as you see something wrong. Problem is people try to fix problems quickly, but they don’t fix the root cause. Why? Because they didn’t ask why enough. The Five Whys is not new. It comes to us from Taiichi Ohno, the creator of the Toyota Production System. He believed that if managers wanted to start with a clear and accurate assessment of any problem, they had to ask why five times before trying to create a solution. I also mention the case of Bill Zollars at Yellow Transportation– he wanted the company to start exceeding customer expectations by making sure their clients were very satisfied, not just satisfied, mind you, but very satisfied. He found out that the assessment his VP of Marketing had made of customer satisfaction was way, way off. And he found this out because he delved deeper. He checked the accuracy of their assessments. Sure – I come from a background where you hire for experience. While researching this book, I found out that sometimes it’s more important to hire attitude over experience. There’s another myth out there that says that anyone can accomplish anything if they just put their mind to it. There’s so much junk science out there that I had to really to clear the weeds, to find out what really works. For example, research tells us those managers who make sure there’s the right fit between people and their goals before they take action double the likelihood of success. There are people who are perfectly suited for the New York Yankees style of management. Others aren’t. Sometimes the HR bureaucracy doesn’t give you the time. I talked to a manager who said they had 45 minutes to interview each candidate, which was simply not enough to get to know someone before hiring them. HR sometimes is its own worst enemy. Now at IKEA we have something different. Why? Because Pernille Spiers-Lopez, the president of IKEA North America. spent four years as manager of human resources for IKEA North America before being named president. She doesn’t have to put up with the nonsense. They’ve totally reinvented the HR function and it’s a beautiful thing to see. I did not talk about this in the book, but the IKEA hiring process gives them a competitive advantage. HR people are dying to get a seat at the strategy table. They have to be invited to the table because they bring something to the table. Traditional HR does not. The key again is to connect personal goals to the goals of the organization. And sometimes that doesn’t just happen. As a leader, you have to make it happen. And if HR is going to be relevant, its got to become better at identifying and discovering talent. And you’re only going to make that happen if you can outmaneuver the CAVE people. Who are these CAVE people? Anand Sharma at TBM Consulting Group gave me that acronym. CAVE stands for Citizens Against Virtually Everything. Just as our bodies have an immune system that assaults everything new and unfamiliar, organizations have their own auto-immune response that impulsively and instinctively attacks everything new or different- the CAVE people. They work overtly and covertly to undermine the change initiative your company is depending on. In the book I outline the strategy for outmaneuvering them, to give your change initiative a fighting chance of success. Can you give us a hint how? How do you outmaneuver the CAVE people? 1. Kick off your change initiative with a “wow” event. The bottom line is to execute, you simply have to get past the CAVE people. Why are some people so motivated? And others so unmotivated? And why do incentive plans not work? That’s something I examine in the book as well. This is all great, actionable knowledge for executives who want to get things done. We should let people buy the book to get the full story. Thanks for all your time. Kempner’s comment made me think- aside from the fragmentation of media, people don’t listen anymore. They are closed to voices outside their comfort zone. Not only is there no conversation, there is no attempt at dialogue. Either/Or. For us or against us. And this explains why people who listen to Pat Robertson won’t hear any other voices, period. I’m guilty too. I listen to the voices I want to hear, and discount others. I’m not saying everyone should have equal time. But it helps to have different perspectives. Edge perspectives. Is there anything or anyone that unites us? Events, perhaps, like Katrina or the World Cup. But even with Katrina, we saw the bifurcation of reality based on politics. Chris Charron defines a digital experience as products and services integrated end-to-end under the control of a single application. Digital experiences have three parts: 1) available content and services; 2) personal control devices; and 3) portable players and peripherals. All of these parts come together under one application in a single business model. This is a good start, but it is a “business-view” of experience. Digital experiences are not restricted to on application or a single business model. That’s why businesses are having such trouble dealing with digital experiences. Digital experiences are transcendent experiences, and go beyond content and services. The part Chris Charron leaves out is interaction. And digital interactions span applications, devices, and most importantly, business models. Human beings are not business models. “Japan said it will halt U.S. beef imports until Washington clarifies how the parts got into the shipment. Japan lifted a ban on U.S. beef just a month ago. I gave up eating beef a few years ago; can’t say I miss it at all. Does anyone trust the government anymore? My point- at least PR is trying to tell a story. So how does advertising fight back? With knowledge and entertainment, and yes, branded-experiences. Problem is most agencies are too stupid. Maybe it’s the stupidity of the clients. Both PR and Ad agencies are inauthentic. Why do you want to hear propaganda and lies all day long? Give us truth, knowledge, insight, and a little bit of humor. Talk, don’t preach. Get a conversation going. And don’t talk about your products unless I ask you a question. Of course, I’m talking about double loop marketing. ” Hollywood took 7% less at the box office in 2005 than in 2004 and growth in sales of DVDs has slowed. Internet video threatens the satellite and cable systems of companies such as News Corporation and Time Warner. Dozens of advertisers are shifting budgets from television to such places as the internet and billboards. Brand-owners hate it that people are using digital video recorders to avoid their pitches. And if media firms move on to the internet themselves, they risk losing their films and television programmes to pirates. Hollywood has lost its imagination. The irony of it all – Michael Eisner gets his own show on creativity and innovation while the very company he helped destroy [Disney] is negotiating vigorously to acquire Pixar. Britannica vs. Wikipedia vs. Digital Universe vs. Squidoo vs. ? Who wants to be the knowledge repository for all mankind? I’m betting on two things: “free” and “ease-of-use” – and the winner (today) is Wikipedia. John Hagel: Consumer Electronics Show – in Shanghai? The global innovation landscape is changing. And Hagel’s got his finger on the pulse. Doug Smith: What Do People Who Work at the IRS Stand For (Part 2)? I’m amazed at Doug Smith’s constant and unrelenting fight to set things straight. Take a look at www.douglasksmith.com. See what I mean? The nerds at McKinsey are at it again with their sweeping generalities and “big-picture” historical perspectives. “Those who say that business success is all about execution are wrong. [what?!!] The right product markets, technology, and geography are critical components of long-term economic performance. Bad industries usually trump good management, however: in sectors such as banking, telecommunications, and technology, almost two-thirds of the organic growth of listed Western companies can be attributed to being in the right markets and geographies. Companies that ride the currents succeed; those that swim against them usually struggle. Identifying these currents and developing strategies to navigate them are vital to corporate success. Here are the trends they’ve identified. Wow, I’m speechless. 1. Centers of economic activity will shift profoundly, not just globally, but also regionally. 2. Public-sector activities will balloon, making productivity gains essential. 3. The consumer landscape will change and expand significantly. 4. Technological connectivity will transform the way people live and interact. 5. The battlefield for talent will shift. 6. The role and behavior of big business will come under increasingly sharp scrutiny. 7. Demand for natural resources will grow, as will the strain on the environment. 8. New global industry structures are emerging. 9. Management will go from art to science. 10. Ubiquitous access to information is changing the economics of knowledge. Advice to CEOs – if this is the advice you’re paying McKinsey for, save your money! Just read your Economist and the Global Province every week and you’ll come out ahead! Will Steve Jobs Start Blogging? Your new iLife software has a blogging application. When will you start your own blog? He’ll never get a few days of rest. So the answer is no, the man will not be blogging! Apple is doing phenomenally well these days. It seems it’s doing a textbook job of maintaining huge market share in digital music players, long after most experts thought that share would erode. And it’s doing so with the same proprietary strategy that many thought would never stand up to an onslaught from the likes of Microsoft (MSFT), Wal-Mart (WMT), and Yahoo! (YHOO). Can Apple keep it up? I don’t think so. Look at any industry — not just computers and MP3 players. You also see it in aircrafts and software, and medical devices, and over and over. During the early stages of an industry, when the functionality and reliability of a product isn’t yet adequate to meet customer’s needs, a proprietary solution is almost always the right solution — because it allows you to knit all the pieces together in an optimized way. But once the technology matures and becomes good enough, industry standards emerge. That leads to the standardization of interfaces, which lets companies specialize on pieces of the overall system, and the product becomes modular. At that point, the competitive advantage of the early leader dissipates, and the ability to make money migrates to whoever controls the performance-defining subsystem. In the modular PC world, that meant Microsoft and Intel (INTC), and the same thing will happen in the iPod world as well. Apple may think the proprietary iPod is their competitive advantage, but it’s temporary. In the future, what will matter will be the software inside that lets users find exactly the kind of music they want to listen to, when and where they want to, with minimal effort. But Apple has that software. It can be the one to provide that to everyone else, if it chose to, right? I’m concerned that they’ll miss it. It’s the fork in the road — and it’s comparable to the fork they faced when they chose not to open up the Mac in the 1980s, when they let Microsoft become Microsoft. How long will Apple have to make this change? I’d be very surprised if three years from now, the proprietary architecture is as dominant as it is now. Think about the PC. Apple dominated the market in 1983, but by 1987, the industry-standard companies, such as IBM (IBM) and Compaq, had begun to take over. Christensen also says something interesting about hedge funds: don’t even think about them as shareholders! 5. China is becoming a catalyst for growth in emerging markets throughout the developing world. 6: China is becoming a market for high-end luxury items once thought to be “exclusive” for the western elite and Middle-East oil-barons. “Because they are in such a hurry to make a place for themselves, and because it is still early in the life cycle of their ambition, Chinese entrepreneurs tend to give the impression that they don’t care much about quality. However, that is not universally true. Many of them recognize the trade-offs among cost, quality, and time that exist for any startup, and they have explicitly chosen designs and processes that sacrifice quality for the sake of speed and cost savings.